P.G. 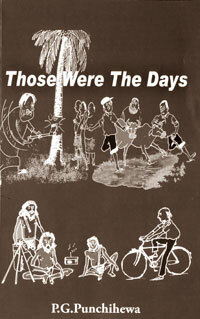 Punchihewa's "Those Were the Days" lives up to its title. Having spent many years in the public service (firstly in the Ceylon Civil Service), these memories are a collage of his experiences. P.G. Punchihiewa was a Government Agent in the days which followed the end of the Raj and rural Sri Lanka was a quiet backwater where time had stood still for centuries. Village life had its own ways and no one has written so wryly and compassionately as has Punchihewa in this series of brilliant cameos. He has a particular gift for poking fun at the pretensions and peccadilloes of those climbing the greasy pole of 'upward mobility'. Yet is wit is always thoughtful - how much, indeed, is the style the man. In this book Punchihewa tells us fascinating stories based on his experiences as a postgraduate in England in the sixties, his years as a diplomat in various parts of the world, and decades as a civil service mandarin. Over those years he acquired huge knowledge and experience but he remains the same humble man. One of the most amusing chapters is 'The Government Agent and the Drunken Chauffeur' in which Punchihewa tells the story of how a G.A's chauffeur got drunk and it was the G.A. who had to drive with the said chauffeur asleep on the back seat. A rebellious and unruly crowd stopped the car and ordered the driver out. From the point of view of anthropology 'Vaddas and Communication Technology' is fascinating. He quotes a Cambridge researcher, Dr. Seligman, who visited Sri Lanka in 1910 and even then believed that this indigenous people would soon become infixed with the general population. Punchihewa points the sad parallel of degeneration with that of the Australian aboriginals, which has received world coverage while the Vaddas are known only to Sri Lankans and professional anthropologists. 'There is no doubt that Vaddas were among the earliest settlers in the island.' Punchihewa ends on a humorous note with 'The Four Sri Lankan Heroes in Blightly'. Swinging London in the sixties is a far cry from the wretched metropolis it has become but the author captures the flavour of freedom it wafted before the nostrils of Commonwealth students in England and what they could manage to achieve. An unpleasant racially motivated incident is reported and commented on. This chapter will be included in an anthology of 'Immigrant Stories' to be published in the UK in 2008. Read this book and be delighted and amused. 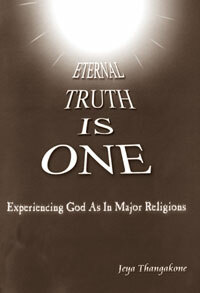 The publication of the book 'Eternal Truth is One' by Jeya Thangakone has come at the right time when the country and the world as a whole have been locked into self-destructive ordeals and war. If we have to survive the current trend, an approach to an existence with a new paradigm is a great necessity which will affirm the unity with all. In this book, the author highlights the underlying unity between major religions. She has shown by parallel references, how the same truth of our existence are illustrated in the major scriptures and how the Divine Ones of each age taught the same truth in a manner that is appropriate to the mankind at that time. The book highlights that when we deeply analyse the Spiritual Truths given by religions, we will eventually discover to the amazement of all concerned that they are joined by a common axle and the unity is only obscured by men's sectarian differences. She has presented the teachings as simply and lucidly as possible in a concise manner and also in a sequence, simplified and readable format which can be easily understood by anyone whether they are familiar or not with the relevant Scriptures. The chronological order of the book will take an ardent reader to the end at a stretch without a break. Another attractive feature of the books is that the author substantiates the views by quoting excerpts from various Scriptures which preclude one to refer the Scriptures as he reads the book. The other fact that impresses is the sequence in which the facts have been presented. She takes from 'Creation' to 'Death' and 'After Life', which makes it a complete book highlighting most of the facts one may generally yearn to know. She has taken an initiative to make one understand the Life after Death, thus dispelling our greatest fears on the unknown death. The book focuses on the wisdom of religious teachings and supports with the findings of scientific research too wherever possible. "In the twentieth century, there were many who believed that religion was on its way out in our world. The twenty first century is proving quite the opposite. Religion is undergoing revival in many parts of the world and all religions appear to be alive and well. It is certainly a factor that we have to take into account in our modern world. Is this a development that we should all welcome? Undoubtedly, almost all the conflicts we experience in our world today are basically religious conflicts and the revival of religion may mean more conflicts in our world. But not necessarily so. We should welcome the revival of religion that opens up all of us to the truths and insights of all religions in our multi-religious world, rather than lock us up in our own. I firmly believe that inter faith dialogue and collaboration, and better inter-religious relations hold the key to better relations and peace among nations and various communities. Jeya Thangakone's book will be a most useful contribution to building up better and friendlier Hindu Christian relations. She draws parallels between Hindu beliefs and Christian beliefs, all of which are valid, and show us how our different understandings of the important issues of life can complement one another. The world needs very much a new paradigm to relate the different religions of the world with one another, avoiding the temptation of giving our own religious pride of place in such a paradigm. We must move beyond what we called tolerance into a world in which we look upon all religions with mutual respect and appreciation," says Bishop Kenneth Fernando in his Foreword to the book. The author draws a dazzling array of sources from the ancient Scriptures to the findings of science, to produce a work of compelling novelty on the Eternal mystery. The books sheds light on so many of our confusions thus illuminating the nature of man. The author presents brilliantly a wonderful variety of facts, weaving between religious scriptures, science and our common societal understanding by grouping, comparing and analysing them. The current moral vacuum that exists in our society is influenced by materialism on the one hand and racial, national and religious prejudices on the other. Laws, education and religious teachings alone cannot replace the restraints on personal conduct of a person, as moral values are means of regulating the behaviour of people. We are in an age of individual insecurity due to various sufferings brought about by our own families, communities and nations due to lack of spiritual knowledge and understanding of the mystery of our life. Author feels that in this perspective, when one understands that the Spiritual Truth is Eternal and is one for all beings, it brings about a change in a person to pursue the common goal and purpose for which we were created instead of fuelling disharmonies within families, races, religions and nations. As a member of an international 'Inter-Faith Dialogue' D. Sooriarachchi says, that the author has made a genuine effort to draw parallels in a bid to narrow down the differences and to highlight similarities and the book can be read from different points of view. First, as a very good collection of references on a number of topics and secondly, as a good comparison of similarities of great religions. General Secretary of All Ceylon Hindu Congress, K. Neelakandan says that the presentation is a formidable task which should no doubt be commended and that it was really amazing to realise the research carried out by the author to publish this masterpiece and recommend the book to every one. All in all, the books is an intellectual and spiritual de force. The book is available in most the book shops like Makeens, M. D. Gunasena, Lake House, Sarasaviya, Vijitha Yapa, etc. Published by the National Science Foundation of Sri Lanka. 2008. A major part of the rural and suburban population of Sri Lanka is still dependent on groundwater from wells for their daily requirements. Also, increasingly, groundwater is now being exploited for agriculture. Three districts (Colombo, Puttalam and Jaffna) are already below the basic WHO water requirement of 1000 cu. mt. per capita per year, and this is expected to rise to six districts (with Kurunegala, Gampaha and Kandy) by 2025. Increases in population, incomes and better living standards are reflected in increasing daily water requirements in Sri Lanka (as elsewhere). Consequently, there could be an impending water crisis in the future due to unequal distribution and accessibility to water across the country. It is with the above situation in mind that I started reviewing the book on "Groundwater Conditions in Sri Lanka" by Vidya Jothi C.R. Panabokke, who is one of Sri Lanka's most venerable scientists, still writing at the ripe old age of 82. I will not dwell upon his various research activities, achievements and the vital positions he held in the Scientific Service of Sri Lanka, except to mention that he was Head of the Land Use Division, Dept. of Irrigation (1969-1974) and Director of Research (1974-1979) as well as Director of Agriculture (1979-1982) - a unique career, considering he had deep insights into both water science and soil science (in irrigation and agriculture) and attendant issues. From soils to water, he had provided leadership to land and water management research in Sri Lanka for over 25 years. The book consists of 12 Chapters. The first chapter gives a general overview of the occurrence and movement of groundwater (flow) in the various aquifer types in Sri Lanka and briefly mentions the concept of groundwater quality and its significance. This forms the background to the book. 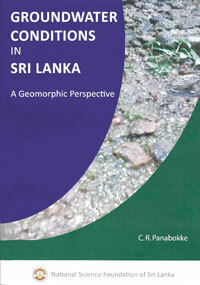 The second chapter is most appropriate as it gives a very informative run-down of the most seminal research publications on groundwater investigations over the past 85 years, highlighting especially the pioneering studies of Sirimanne of the Geological Survey Department (GSD), who laid down the basic framework for groundwater studies in Sri Lanka. The abstracts of these papers are reproduced in this chapter and are a most useful addition to the book and for any water scientist intending to read up on the history of hydrological studies in Sri Lanka. The periods prior to and after the setting up of the National Water Supply and Drainage Board, the Groundwater Exploration Division within the Irrigation Department (ID) and the Water Resources Board (WRB) in 1978 are landmarks in groundwater investigations in the country, as the responsibility for such studies were eventually passed on from the GSD to the ID to the WRB. Today, the mandated authority for water investigations rests with the WRB. Preparation of a bibliography up to the year 2000 by the WRB, a Groundwater Database of the two main State agencies responsible for water affairs, thematic research papers on groundwater, preparation of groundwater maps (1968;1973) are all essential reading for water scientists as emphasized in this book. Chapters 3 to 10 form the core of the book. This is a no frills geomorphic approach to the various aquifer types in Sri Lanka and their hydrological potential. Depending on how you classify them, there are 6 to 8 main aquifer types. There are no demanding hydrological flow equations, pump test and recharge data and other statistical tables to distract the reader from the author's intended geomorphic perspective. The aquifer types and their distributions are dealt with under, a) shallow karstic aquifer of the Jaffna Peninsula; b) confined and semi-confined deep aquifers of the northwestern sedimentary formations; c) metamorphic hard-rock region aquifers of the dry zone; d) shallow, coastal sand aquifers; e) alluvial aquifers; f) laterite aquifers; and g) metamorphic hard-rock region aquifers of the wet zone. Each aquifer type, with examples, is dealt with under previous studies; aquifer properties; present utilization and potential threats and brings into focus the problem of groundwater management issues. These eight chapters are essential reading for anyone initiated in the basic sciences and interested in groundwater issues. Chapter 11 on the "Springs of Sri Lanka" is a short six pages with the intention of "rounding-up" of the groundwater resources by the author. It is a useful listing for the uninitiated reader. The ultimate objective of this book is summed up and discussed in Chapter 12 and emphasizes the critical concepts of groundwater quality, sustainable groundwater use and the need for water quality monitoring. The several appendices at the end of the book are a welcome addition and a very useful effort and will be of much help to the readers. The glossary and index is adequate. No book "gets away" scot-free these days. The reviewer feels that in this day and age of computer graphics, the diagrams were drafted a bit better. Also, available GIS-maps could have better illustrated the links between groundwater aquifers, geology, soils, rainfall distributions and also population densities at district level. Can the water scientists ensure that there is integrated water resources management and distribution in Sri Lanka as implied in the book, and that per capita water availability is kept above the stress-threshold levels, through the conjunctive use of both surface and groundwater? I enjoyed reading this timely publication by Panabokke. It is written in very simple and readable language with no obfuscation of the subject matter. It is an invaluable, non-quantitative compilation of a scientist with over 50 years experience in soils and water. I congratulate the author for spending valuable retirement time to get it out finally and after many years of gestation and dedicated effort. The print quality of the book is excellent. The Rs. 750 price-tag is money well spent and hopes it will not be excessive in these inflation-ridden times. Anybody interested in groundwater should have a copy on his or her shelf. The National Science Foundation, celebrating the 40th anniversary of its existence this year (2008), and whose first Secretary-General was also Dr. Panabokke, is to be commended for sponsoring this publication, which deals with our most precious natural resource. Every person in society has varied experiences in life. However, it is only a few that has the ability and urge to write about such experiences and make a story out of it. Such persons fall within the category of writers. A writer makes use of his/her creative ability to make a story out of his/her own experiences. The writer in creating a story from his experiences, analysing events, appreciating what he considers pleasant sets the stage for the reader to appreciate the experiences of the writer and exercise his imagination. Autobiographies present the reader with the writers' experiences, their success, their trials and tribulations. The reader not only gets informed of such experiences but he tries to relate them to that of his own and participate in them, thus deriving pleasure in being involved in the story. Writers, who have the literary ability, in a way, perform a social obligation or service by writing about their lifestories, experiences and sharing such with the reading pubic. Manu Tissera Gunasekara's book entitled 'Recollections' can be classified as an attempt in this direction. Her effort deserves appreciation. Her book contains sketches of her childhood events both happy and unhappy. One might raise a question at this point. How can a writer's personal experiences, in written form, be literature? I believe the answer to this question is very simple. Literature mirrors society. This is a commonly accepted saying. Literature springs from society. It contains human experiences, recreated by the writer using his or her own feelings and impressions. The writer gains experience by living in society. It is all about people, their mental imagery, their feelings, their actions and reactions. One cannot produce a work of literature without experiences drawn from society. It could be one's own personal experience or something that the writer learns from another, or may be something he has heard from another. Ernest Hemingway wrote his novel, "The Old Man and the Sea" based on experience of an old fisherman in Cuba which had been narrated to the author during his stay there. A talented writer can use either his own experience or that of another but ultimately he has to make it familiar to the reader. The reader should, at some point, feel the relevance to his own experience. I believe Manu Tissera's recollections in this book are her own experiences presented in such a way that we feel that, if not all, some of it at least, we too have experienced. Hence, she has played the role of a good writer, in her maiden work, 'Recollections'. Manu Tissera says in her book, that even though this compilation is meant for readers of all ages, her main focus is on the younger generation. She expects the younger readers to find this book interesting. She further says that she will be more than happy if she could influence at least a few young readers to love and appreciate beauty in life as a consequence of reading her book. In this set of memoirs based on the central character of Father, the six stories bring out the vivid and natural encounters in a family against the most human and loving aspects of life. The first story titled, "My Grandmother", depicts the conventional old day Sri Lankan grandmother who extends her love and care to her children as well as her children's children. Much adored by her family and neighbours, she is a warm personality. The subtlety of the relationships is the base for the entire collection. Reflections were made on those beautiful days of happiness and laughter as well as on the lonely and pensive. The value of being conscious of the present without pondering unnecessary on a past that is already gone, or an unforeseen future, to reflect positive on life by endorsing the different qualities that one find through the number of associations with the family and the society at large, are some of the messages that the collection put out. The dark qualities that one often sees in individuals have been omitted on purpose, while perceiving such qualities in individuals. While drawing incidents from the author's own experiences from childhood which she intends to share with the readers she says that, "These stories are meant in their essence not so much as portraying their individual characters but recording their history, by bringing out the once vital and vivid pictures of a family against the most human and loving aspects of life." Appreciation of family values and thereby encouraging the reader towards this aspect can be seen as the main intention of the author. The story of the grandmother ends up in solitude, where the writer in a pensive mood recollects the fond memories she was once within, which she finds too difficult to leave behind. Then the next set of three stories represents three individuals, who are externally and internally connected to the author's family. These characters which the reader claims through the eyes of the author are empathetic, different to one another and hold different social values and norms. But at one single point they are all part of the extended family. The central character in the collection is the author's Father, around whom all the stories evolve. She looks up to him as an educator, a mentor and above all a humble human being who taught all those near him the value of being pragmatic.. "Give more time for planning. But he was not a theorist. Plan and plan, will make you no one. Plan and act was his vision". Manu Tissera, in her simple style makes the reader visualise the real person in this character-the Father. Then the moulding of the author's own character is depicted in the story "70's and 90's. The early childhood desires and aspirations and how they have evolved with age and maturity are all visualized. The story speaks of the multi-faceted ambitions that are being developed during childhood, and how they have helped shape perceptions on life. "Relationships, love and care, happiness and togetherness, separation and solitude are a very much part of all our lives." The author opines that life is full of pleasant and unpleasant experiences, emotions we face as we pass through life. 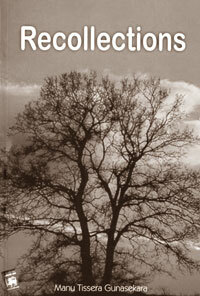 The book, 'Recollections' comes out as a collection of stories which are exciting and full of vivid incidents. A glimpse of the writer's childhood is well depicted there. The father, the grandmother, the chief priest, Mr. Minekawa, and the little son, are pictured as lively characters in the stories. The father, grandmother and the other elders are highlighted as those who moulded her life. The little son represents the younger generation which the author hopes will uphold and cherish family values in the future.